Whisk the hoisin, sugar, soy, sherry, cilantro stems, scallion whites, ginger, garlic, orange zest and 1 1/2 teaspoon of the cayenne in a bowl. Pat the ribs dry with paper towels and season with salt and pepper. Grease your slow cooker with vegetable spray and arrange the ribs standing and wrapping around the rim of the cooker with the meaty side facing outwards. Pour the sauce over the ribs, cover and cook for 6 to 8 hours on low. Set up and preheat your broiler. Line a baking sheet with foil and place an oven safe rack in it. Coat the rack with vegetable oil. Place the ribs meat side down on the rack. Strain 3 cups of cooking liquid from the cooker into a sauce pan. Whisk in the hot pepper jelly, vinegar, cilantro leaves, and remaining cayenne pepper to the liquid. Bring to a simmer and cook for 15 to 20 minutes until thickened. 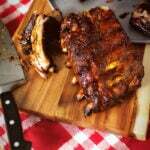 Brush the ribs with the sauce and broil 2 to 4 minutes. Carefully flip the ribs over, brush with sauce and broil another 8 to 10 minutes, until ribs are sticky and browned, brushing with liquid every 2 minutes. Tent the ribs with foil and allow to rest for 10 minutes before slicing and serving with minced scallion greens and additional sauce if desired.